On one hand, compartmentation, or the division of spaces through fire-rated building materials, is critical to slowing or stopping the spread of flames and smoke in a fire event. On the other, the opaque forms of standard fire-rated building materials, like concrete and gypsum, limit light transfer and views. This is problematic in modern building design as numerous studies underscore the positive link between access to natural light and improved occupant well-being. To help resolve this dilemma, project teams are increasingly turning to fire-rated glazing in commercial building design. Combining a transparent form with the ability to withstand temperatures up to 870 C (1600 F) or greater, it is uniquely positioned to bring fire safety in line with the daylighting design intent. Depending on the selected product, building design teams can use fire-rated glazing to comply with codes and standards and maintain fire ratings from 20 to 180 minutes. As such, it is possible to employ the material to bring daylight deep into interior spaces formerly restricted by concrete or gypsum. Common applications include those in and around evacuation pathways, including stairwells, doors, entrances, corridors, atriums, and lobby walls—all of which benefit greatly from enhanced light transfer. Today’s fire-rated glazing products are virtually clear, wireless, and able to provide the same defence against fire as traditional fire-rated materials. Current offerings provide fire protection (defence against flames and smoke) or fire resistance (defence against flames, smoke, and radiant and conductive heat transfer). CAN/ULC S106,Standard Method for Fire Tests of Window and Glass Block Assemblies. 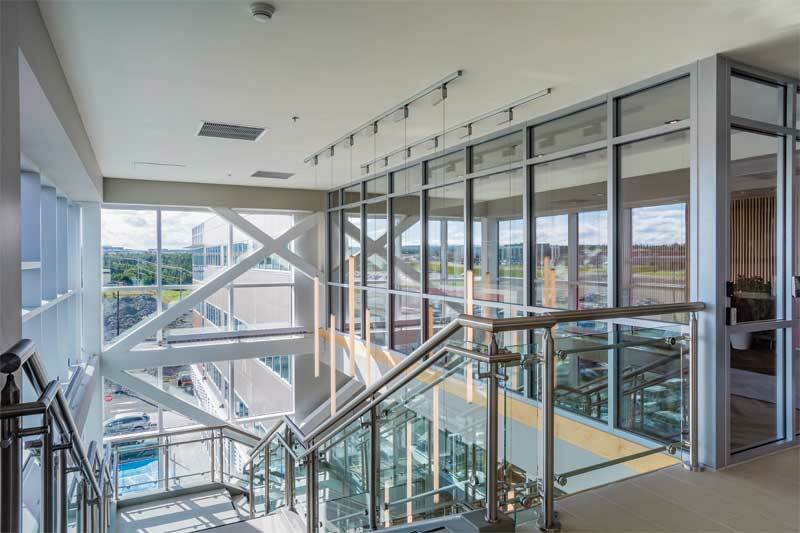 In KMK Place, an office building in St. John’s, large spans of fire-rated glazing separate the main structure from a glass atrium, preserving daylight and views for occupants inside. Such glass is suitable for use in opening-protective applications, including transoms, borrowed lites, and doors. Fire-protective glass can also enhance safety and security as it offers greater visibility for people entering and exiting rooms. UL 263, Fire Tests of Building Construction and Materials. Glass products meeting these criteria keep radiant and conductive heat transfer at bay for the duration of their fire rating. Therefore, they can exceed the traditional size parameters of fire-protective openings, making them suitable for use in locations where the total glazing area exceeds 25 per cent of the wall. This greatly enhances daylighting design freedom. For example, instead of being limited to smaller windows, borrowed lites, and small view panes in doors, building teams can now have large expanses of glass meeting some of the most stringent fire-rated building codes. 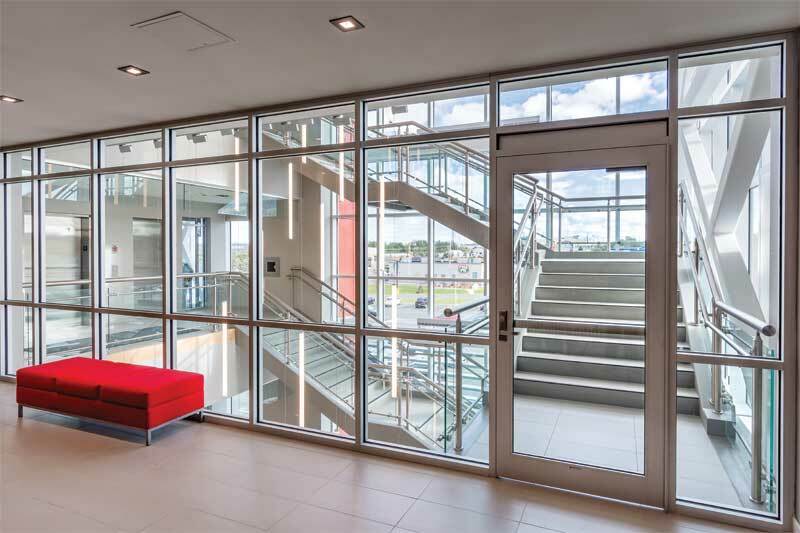 Additionally, manufacturers now offer integrated fire-resistive glass and framing systems. The term ‘fire-rated glazing systems’ refers to the fire-rated glass and frames designed and tested to work together as a cohesive unit, rather than individual components. They not only simplify specification, but also are suited to meet daylighting needs. 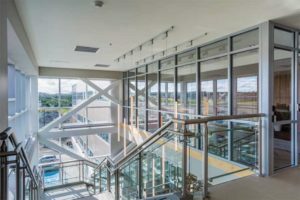 Fire-rated glass curtain walls are one of today’s more common system solutions, providing a substantial area of glazing for interior or exterior applications with fire-rated criteria. One system achieves its multifunctionality by using fire-resistive frames (steel is usually the primary framing material) that are anchored to the structure of the building using common means such as clips, angles, or plates. The fire-resistive glass in the curtain wall system is then typically held in place with a pressure plate. The plate creates the necessary pressure between individual lites of glass, the framing, and glazing gaskets. This is critical to maximize air and water penetration resistance through the wall. It is also important to note the pressure plate fasteners are hidden under a finished cover to suit the desired appearance. 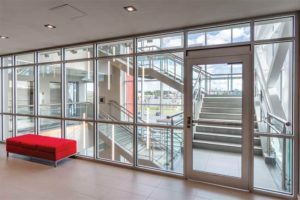 Given the success of fire-rated glass curtain wall systems, a growing number of manufacturers are now adding to their system solution lineup. Here is a look at three recent market introductions and the daylighting benefits they provide.